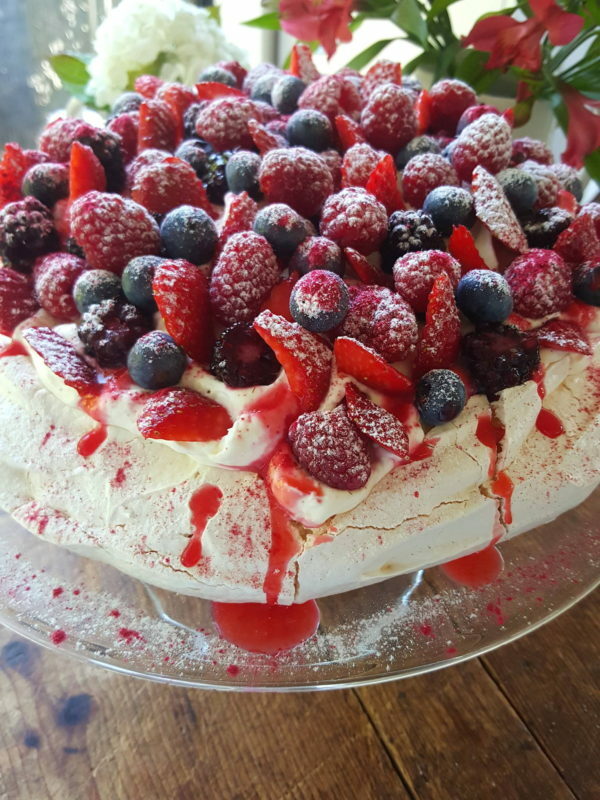 If you've had problems making a pavlova, pavlova perfection is just a click away (click on the Link at the end of the recipe). 1 Preheat oven to 120°C (250°F) – do not use fanbake. Line a baking tray (baking sheet) with baking (parchment) paper, and on the curly side, trace out a 20cm (8”) circle. Turn paper over (it will now lie flat). 2 Put egg whites and salt in a greasefree bowl of an electric cake mixer. Whisk egg whites on a slow speed to begin. Once a soft foam forms, (about 2 minutes), increase the speed and whisk until stiff (less than 2 minutes). Continue whisking while adding caster sugar a tablespoon at a time. I usually drop the speed of the machine while adding the sugar to prevent it spraying everywhere but do not stop the machine, nor scrape down the sides of the bowl, during the process. Whisk for several minutes more until very stiff, then turn off machine and sprinkle over cornflour, vinegar and vanilla extract. Use a large metal spoon to carefully mix ingredients together without deflating the whipped whites. 3 Transfer mixture in dollops to the prepared baking tray, and keeping it within the traced circle, quickly smooth it into a rough round – don’t try to make it perfect or fiddle with it unduly because you’ll knock out air. Rough is good! I put a few dabs of the mixture under the baking paper to keep it in place (imagine if your perfectly baked pavlova slid off the baking tray as you removed it from the oven!). 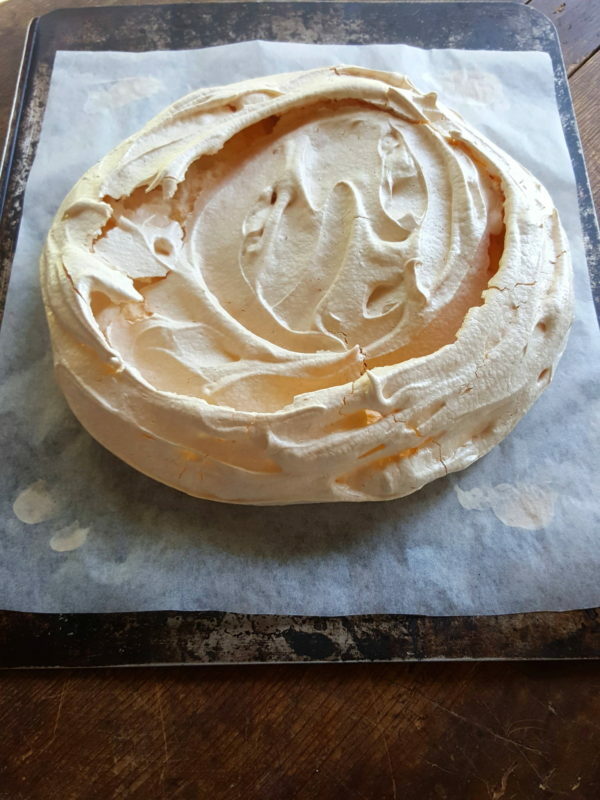 Put meringue on baking paper in dollops. Spread out with a flat-bladed knife, but don’t fiddle too much! 4 Bake in oven for 1 hour, by which time the meringue should be crisp on the top; it may be slightly sunken under the crisp shell but this is normal. Turn oven off and leave pavlova in oven for at least 1 hour, but preferably until the oven is cool (overnight is fine, just remember to remove it before you start the oven again!). It’s perfectly normal for the meringue shell to crack slightly on top after cooking. 5 When ready to assemble, carefully turn pavlova over onto your hand and peel away the baking paper. 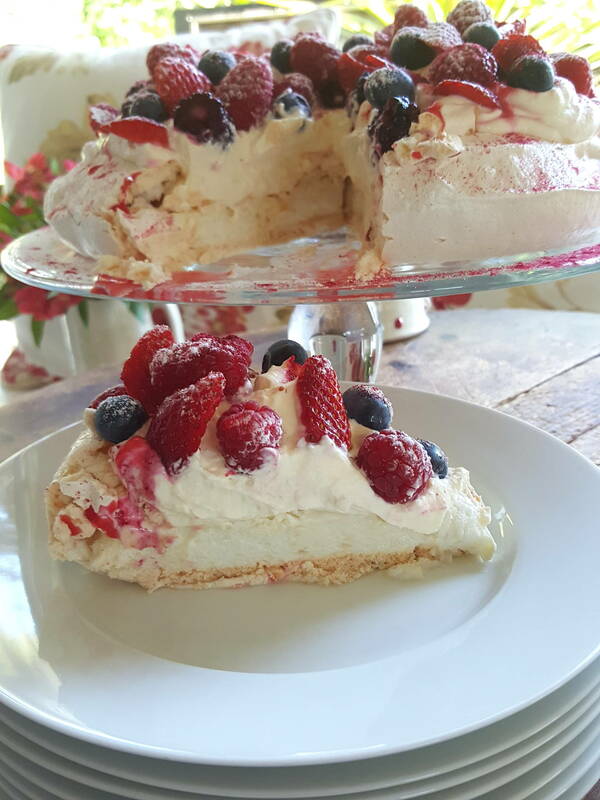 Transfer pavlova to a cake plate or cake stand. 6 Lightly whip cream until thickened and holding shape, but be careful not to over-whip it or it will turn buttery. Beat the yoghurt (read yoghurt tips here) until sooth in a separate bowl, then fold it through the cream. Do not beat or mix for too long or it may turn buttery (if this happens, let it down with liquid cream). 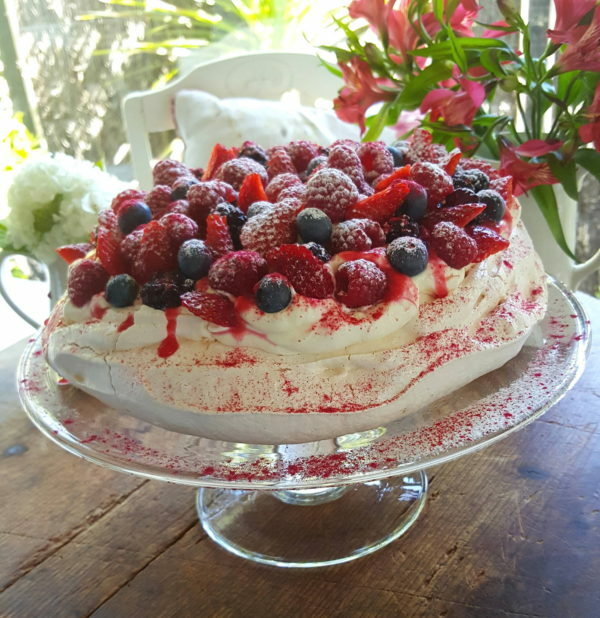 I like to put a few dabs of cream under the pavlova to help hold it in place, especially useful if you have a rimless plate or cake stand! 7 Gently tap the top of the pavlova, smashing it just a little to form a cavity for the cream (it will be somewhat hollow under the meringue shell), keeping the sides intact, but don’t fret if they crack or splinter. Put dollops of cream on top of the pavlova. Top with berries of your choice – sliced strawberries, raspberries, blueberries,halved blackberries or boysenberries all work well. 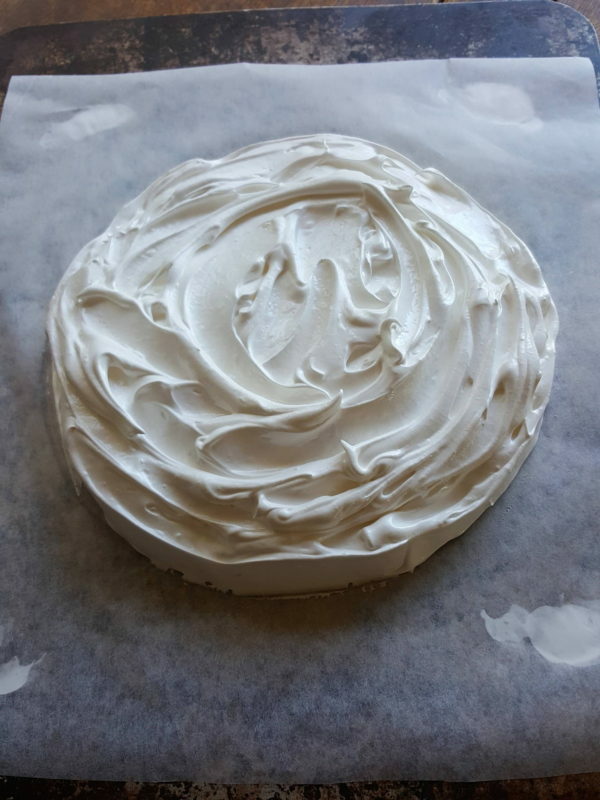 Either leave in a cool place for up to 2 hours, or transfer to the fridge for 4-8 hours; the pavlova will soften somewhat in the fridge and there’ll be a gorgeous contrast between crisp shell, marshmallowy meringue and rich velvety cream. Heavenly! Before serving, dust with icing sugar, and raspberry powder, if using. Pass a few raspberries or strawberries through a sieve to make juice and drizzle over fruit. It might be hard to believe until you try this, but Greek yoghurt in place of cream works a treat, and makes a pavlova with fewer calories. Use 500g, or in the US, 16fl ounces will be sufficient, thick Greek-style yoghurt, choosing one thickened naturally, not with gelatin or stabilisers. If the yoghurt you buy is thin and watery, you’ll need to drain it (otherwise it will weep in the assembled pavlova). Consequently, it’ll lose some of its volume. If you are not familiar with the brand of yoghurt you are buying, it’s probably wise to buy an extra tub to make sure you have enough. Here’s how to do it: simply tip the yoghurt into a sieve lined with paper towels and leave to drain for 1-2 hours, letting the whey drain off. Tip strained yoghurt into a clean bowl and whip with a spoon until thick and smooth. Greek yoghurt flavoured with lemon curd or mango puree is also a good flavour match with raspberries, or use plain Greek yoghurt and dollops of mango puree or homemade lemon curd. In this recipe I use a blend of double cream and thick Greek yoghurt which gives a luxurious velvety filling. 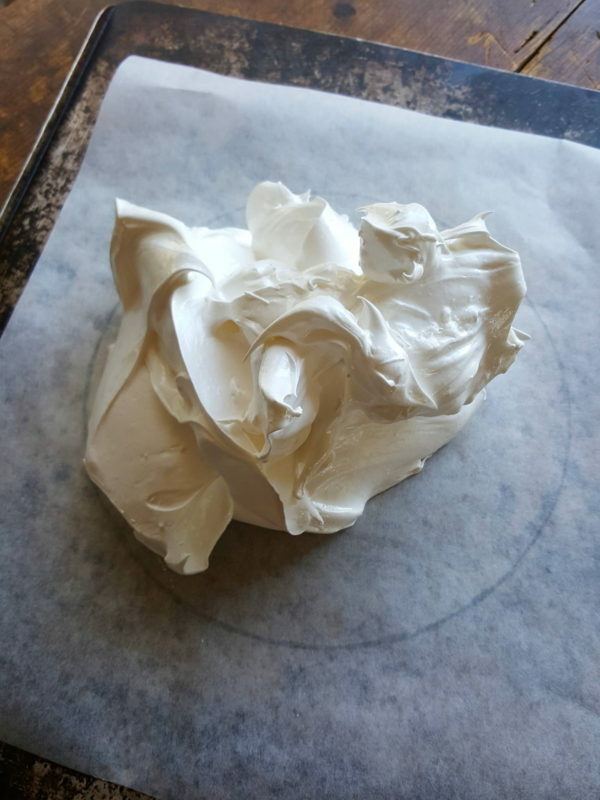 Check this Link for more information on meringues, how to use all yoghurt and no cream, how to make pavlova with a limoncello cream, and how to whip double cream successfully.